5-pocket raglan warm-up jacket with rib cuffs and collar, kangaroo pockets, open back yoke vent, and snap-front closure. Center back length: 29". 3-pocket lab coat with updated collar, front pockets, chest pocket with pen slot, loose bck belt and double English style back vent. Center back length: 32". Sleeve length: 24" - 25". 3-pocket rounded notch collar lab coat with pen slot and loose back belt with button. Center back length: 32". Sleeve length: 25¼" - 25¼". 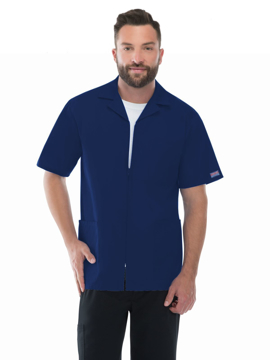 This polo features stain-resistant, moisture-wicking properties with matching ribbed collar, hemmed sleeves, three-button placket, dyed-to-match buttons, and side vents. This polo features combed cotton, ringspun interlock knit, matching collar and banded sleeves, three-button placket, dyed-to-match buttons, reinforced shoulder seams and double-needle hem. This polo features combed cotton, ringspun pique knit, matching ribbed collar and banded sleeves, three-button placket with dyed-to-match buttons, reinforced shoulder seams, and double-needle hem. This polo features a feminine fit, stain-resistant moisture-wicking polo with matching ribbed collar and three-button placket with dyed-to-match buttons, v-notch detail on sleeves and stylish curved hemline. This polo features combed cotton, ringspun pique knit, feminine fit, matching ribbed collar and banded sleeves, three-button placket with dyed-to-match buttons, reinforced shoulder seams, and double-needle hem. 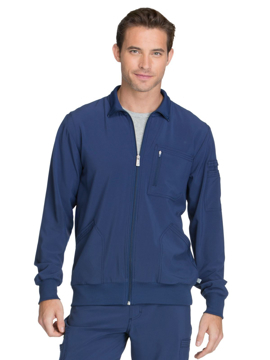 A contemporary fit zip front jacket with signature logo zipper pull, front zipper pockets, front and back shoulder yokes, rib-knit collar, cuffs and waistband, coverstitch detail. Center back length: 22". 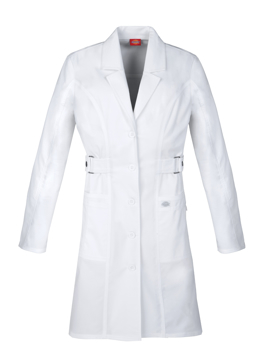 This men's twill consultation lab coat features a vented back and lapel collar. 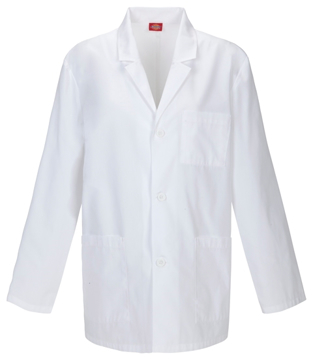 This multi-pocket lab coat includes three outside pockets, three inside pockets and a breast pocket. This style #1389 features the regular fabric. Center back length: 31". 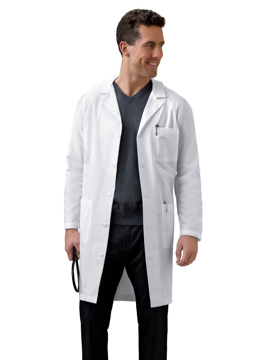 This men's twill consultation lab coat features a vented back and lapel collar. This multi-pocket lab coat includes three outside pockets, three inside pockets and a breast pocket. This style #1389AB features the Certainty Plus® fabric. Center back length: 31". 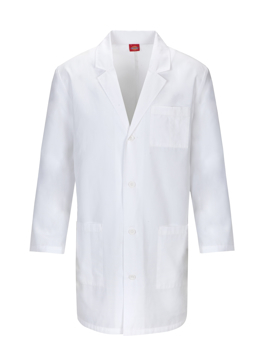 This men's twill consultation lab coat features a vented back and lapel collar. This multi-pocket lab coat includes three outside pockets, three inside pockets and a breast pocket. This style #1389A features the Certainty® fabric. Center back length: 31". 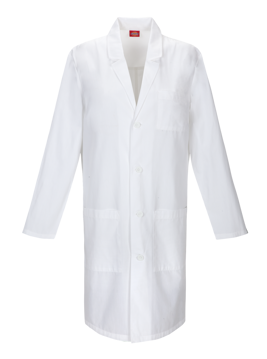 Shaped lab coat with notched collar, slanted patch pockets, and cutaway front. Adjustable tie back belt. Center back length: 30". This classic short sleeved knot features hand tied stylish knot buttons. It has a double breasted front enclosure for unisex styling. The coat also has a front patch pocket and thermometer pocket on the sleeve. Center back length: 29¼". This classic contrast coat features black buttons and contrasting black cuffs and collar. It has a double breasted front enclosure for unisex styling. It has a front patch pocket, thermometer pocket on the sleeve and turned back cuffs. Center back length: 29¼". This classic coat features ten pearl buttons. It has a double breasted front enclosure for unisex styling. It has a front patch pocket, thermometer pocket on the sleeve and turned back cuffs. Center back length: 29¼". This classic short sleeved coat features Dickies pearl buttons. It has a double breasted front enclosure for unisex styling. The coat also has a front patch pocket and thermometer pocket on the sleeve. Center back length: 29¼". The chef coat is a favorite. Single needle top stitching and covered buttons add to the style of the coat. It has a front patch pocket and thermometer pocket on the sleeve. The mesh back vent keeps you cool in the kitchen. This style also has contrast piping. The long sleeves on this coat have turned back cuffs. Center back length: 30½". This men's v-neck top features a chest pocket with pencil slot, front welt pockets, one with inside cable-routing grommet, knit collar, back yoke, side vents, and coverstitch detail. Center back length: 29". A men's v-neck top with a knit collar with bungee loop, half-welt chest pocket, left sleeve zipper pocket, and front and back yokes. Center back length: 29". A men's zip front warm-up jacket featuring a chest zipper pocket with inside tonal cable-routing outlet, slash pockets, back yokes, and tonal rib-knit cuffs. Center back length: 27". 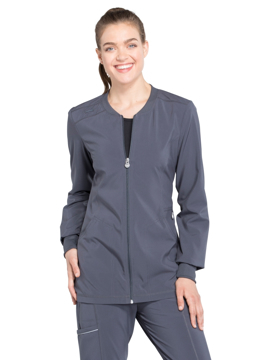 A contemporary fit zip front warm-up jacket with front pockets (the right with inside tonal cable-routing outlet), back yoke with locker loop, and rib-knit collar, cuffs and waistband. Center back length: 25½". 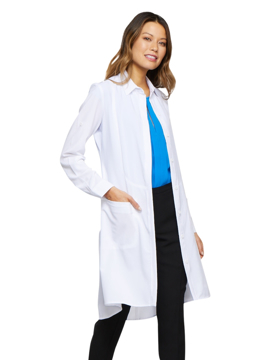 This contemporary fit button-front lab coat features a notched collar, multi-needle topstitching, front and back princess seams, a back yoke, a cell phone pocket, multi-sectional utility slots, two roomy patch pockets, an I.D. bungee loop and side belts that adjust to fit. Center back length: 36". 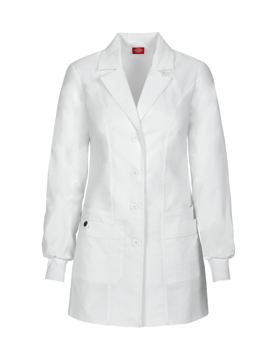 This contemporary fit button-front lab coat features a notched collar, rib knit cuffs and princess seams to add shape. Also featured are a bungee loop on the collar, four patch pockets (one with a functional snap closure for extra security) and pen slots. Center back length 32". 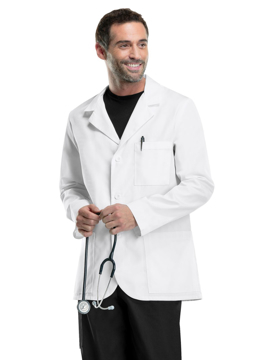 A men's fit consultation lab coat features a notched collar and a three button closure. Also featured is a chest pocket,one inside chest pocket, two patch pockets, and a back kick pleat. Center back length: 31".